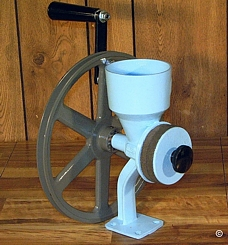 Manufactured in our factory since 1992, the Uni-Ark grain and seed mill has a long life bearing design, with stainless steel wheels and stone interchange ability. The body is a powdercoated, one piece, die cast, ultra light, 356 USDA approved aluminum. 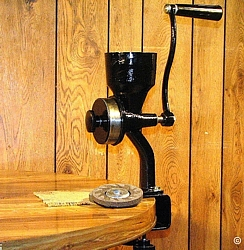 The Uni-Ark is a top of the line hand mill. The Uni-Ark contains no cheap plastic parts, loose springs and key ways prone to get lost or broken during use or disassembly. The ceramic stones or the steel wheels have a lifetime warranty and will be replaced free of charge for the lifetime of the mill. 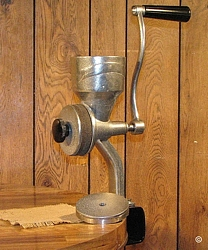 With the permanent grain funnel (approximately 1.5 qt.size) attached to the main mill body, the single foot supports the weight of the unit. The mechanical design is nearly identical to the Little Ark, the main difference being that the Uni-ark's body extends outward to allow ample room for a container to catch the flour. The body of the mill can be either permanently attached to a solid surface or temporarily clamped on to the table using our non-abrasive table clamp (Part Number RP-95), sold separately. A motorizing kit is available. Shipped with ceramic grinding stones unless otherwise specified. Lifetime warranty to the original purchaser only. Free literature(owners manual) and live technical support for the duration of the warranty period. Dimensions: 14" high, 6" wide, 7 1/2" deep. 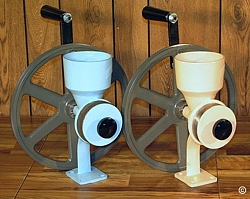 Grinding wheel diameter is 4". Complete owners manual and complete parts schematic is included. Shipping weight of 9 pounds. Shipping is free if paid by check or money order. Little ark has 2 feet which makes it more stable for motorization. 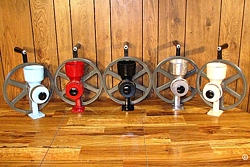 The Little ark has several different sizes of funnels available, 1 to 5 quart funnel sizes. The Uni-ark has a larger size chamber area to accommodate larger grains, such as nuts, corn, and beans. 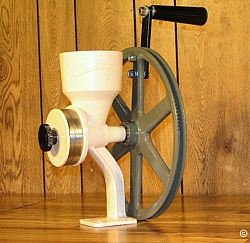 The little ark does a better job when it comes to grinding smaller grains such as wheat. The Little Ark was designed about 50 Years ago with the intention of being motorized. It's unique two foot wide stance makes it a very sturdy machine when powered by a motor and a pulley. It can also accept several sizes of funnels needed for motorization purposes in mind. 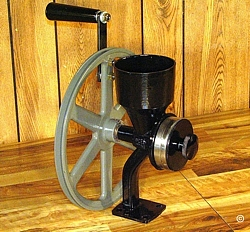 We make funnels up to 6 quarts in size, which allows you to operate the machine for a very long time before refilling. 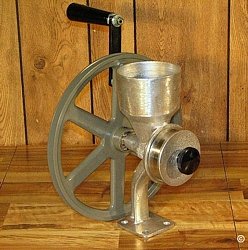 This makes it the largest capacity hopper for any hand mill on the market today. You do not have to spend several hundred dollars on comparable machine to accomplish this anymore. 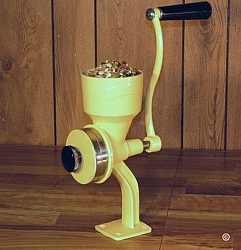 This mill comes with a standard one quart size hopper.